“Courage,” Winston Churchill explained, is “the ﬁrst of human qualities . . . because it guarantees all the others.” As a naval officer, P.O.W., and one of America’s most admired political leaders, John McCain has seen countless acts of bravery and self-sacrifice. Now, in this inspiring meditation on courage, he shares his most cherished stories of ordinary individuals who have risked everything to defend the people and principles they hold most dear. “We are taught to understand, correctly, that courage is not the absence of fear but the capacity for action despite our fears,” McCain reminds us, as a way of introducing the stories of ﬁgures both famous and obscure that he ﬁnds most compelling—from the Nobel Peace Prize laureate Aung San Suu Kyi to Sgt. Roy Benavidez, who ignored his own well-being to rescue eight of his men from an ambush in the Vietnam jungle; from 1960s civil rights leader John Lewis, who wrote, “When I care about something, I’m prepared to take the long, hard road,” to Hannah Senesh, who, in protecting her comrades in the Hungarian resistance against Hitler’s SS, chose a martyr’s death over a despot’s mercy. These are some of the examples McCain turns to for inspiration and offers to others to help them summon the resolve to be both good and great. He explains the value of courage in both everyday actions and extraordinary feats. We learn why moral principles and physical courage are often not distinct quantities but two sides of the same coin. Most of all, readers discover how sometimes simply setting the right example can be the ultimate act of courage. 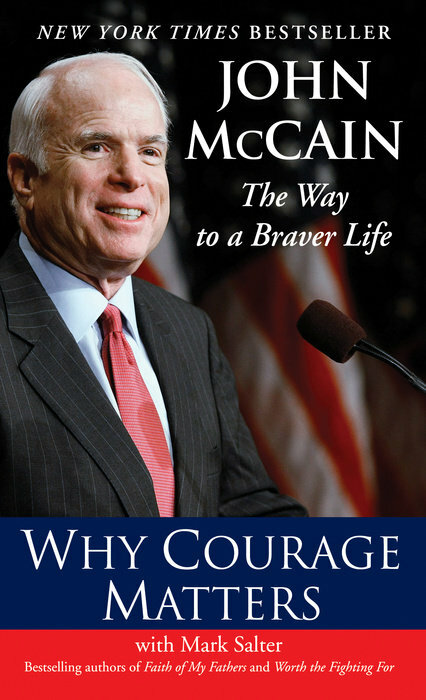 Written by one of our most respected public ﬁgures, Why Courage Matters is that rare book with a message both timely and timeless. This is a work for anyone seeking to understand how the mystery and gift of courage can empower us and change our lives.